If players have had a quick look at the comments about Minecraft Tower Defence 2 made by hundreds of players, you know that you are going to play a great game. In the game, you are helping a Minecraft boy to seeking a safe place to stay and fighting against a wide range of variety such as wolves, zombies, or creepers. Later waves, more types of enemies appear, so your skills of choosing traps and setting them must be calculated wisely with the money given to players in the beginning. For each kind of enemy, there will be a suitable trap for knocking it down. Often, at the beginning of the game or each wave, there are some useful information shown on the screen to guide you. For instance, it is more effective to upgrade an item than to buy a new one, or TNT can destroy traps around it. 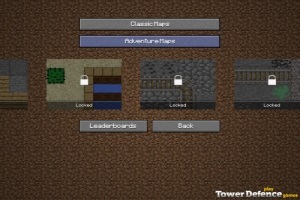 Minecraft Tower Defence 2 shows two playing modes including Adventure and Survival. In its mode, you are required to accomplish challenges to save as the medals. The list of challenges is given right under the screen of game. Let see how many challenges you will win and how long you can keep the Minecraft boy alive! Left of the mouse is used to dig and place traps.